In the Package Explorer view right click on the project and select Properties. In the left hand side tree click Builders. 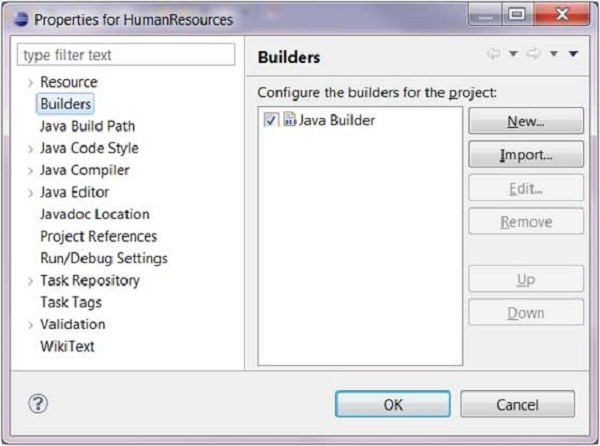 It's the java builder that distinguishes a Java project from other types of projects. By click on the New button you can associate the Ant builder with a java project. The java builder is responsible for compiling the java source code and generating classes. The java builder is notified of changes to the resources in a workspace and can automatically compile java code. 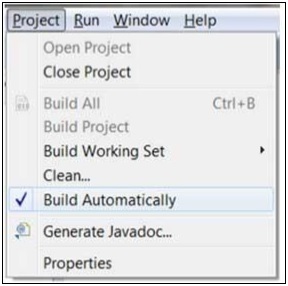 To disable automatic compilation deselect the Build Automatically option from the Project menu. If automatic compilation is disabled then you can explicitly build a project by selecting the Build Project menu item on the Project menu. The Build Project menu item is disabled if the Build Automatically menu item is selected.